Before beginning any reading or course in zombie survival, it is essential that you have a clear understanding of what a zombie is, how it is created, the main types and, most important of all, how you can ‘kill’ a zombie. There is currently no cure for the zombie virus and once contracted by a human, transformation into a zombie is a certainty. 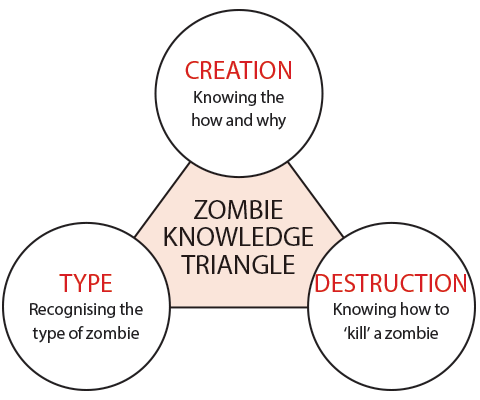 These three factors are the foundation of any zombie survival plan and are referred to as the Zombie Knowledge Triangle. All zombie survivalists must clearly understand how a zombie is created, be able to recognise the different types and deal with the walking dead. 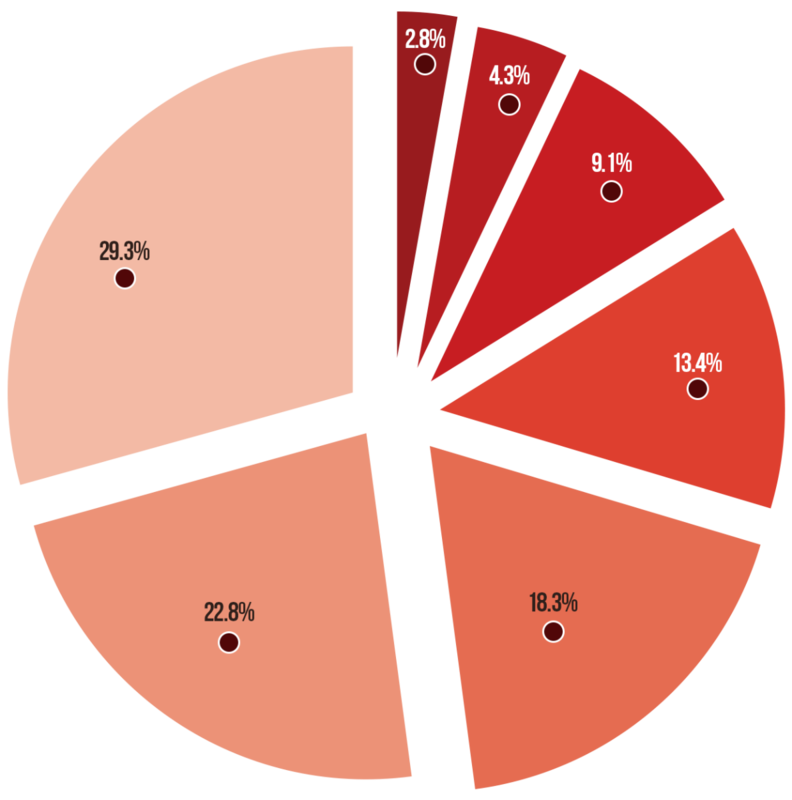 In a recent survey by GeoPol, fewer than 23% of Americans realised that zombism is caused by a virus. Here is a breakdown that shows the level of misunderstanding among the public of the root cause of zombies. Bloated masses of dead flesh in addition to a veritable explosion in the insect life and fungus surrounding these walking corpses.  High numbers of ‘bloaters’.  Higher rate of decomposition. Often referred to as ‘skeleton corpses’, the dead will be thin and wiry with more exposed bone than in other regions.  Bleached flesh stretched tightly. Survivors should prepare to face all types of zombie in the initial outbreak. Depending on the season, most will move towards the classic phase.  Most zombies will be at the desiccated stage within a month.  Fewer bloaters than the tropics. Winter will often keep the dead fully frozen and easy to deal with, but the thaw can see zombies emerge in a particularly rotten and hungry mood. 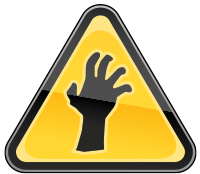  Zombies may be frozen solid and dormant.  Very low level of decomposition. Weapons and more advanced unarmed combat techniques that can be used against the dead will be discussed later. For now it’s enough to know that to kill a zombie you must destroy at least 80% of its brain. Nothing else will work. In zombie combat, we define ‘killing’ a zombie as meaning removing it as threat – in other words, taking it out of the game by ensuring that it never gets up. Technically speaking, you can’t ‘kill’ what’s already dead, but destroying a high proportion of a zombie’s brain will prevent the creature rising again and seeking to feast on the flesh of the living. Aren’t they just like vampires? Vampires are fictional monsters based on a mixture of folklore and creative writing. They have no connection to zombies. There is nothing sparkly or romantic about ‘the undead’ and you won’t be joining ‘Team Edward’ or ‘Team Jacob’ when the dead rise. You’re more likely to be driving an axe through his skull than losing yourself in his good looks. Should I stay away from cemeteries? For the seasoned zombie fighter, a cemetery should hold none of the horror it seems to for fans of ghost or vampire stories. It is a virus which causes the zombic condition. There is nothing supernatural about it and, statistically, very few zombies ‘rise from the grave’. The incubation period for the virus means that there are far more outbreaks in hospital morgues than in chapels of rest or graveyards. More than any creature, the zombie is surrounded by legend, myth and misinformation. The zombie survivalist needs to be aware of these misconceptions. During the zombie apocalypse, panic and lies will be everywhere, rumours of their superpowers will be rife, and such tales will haunt the dreams of any survivors. Don’t Zombies Just Eat Brains? The most powerful myth surrounding zombies is that they only eat brains. Indeed, the classic “Brraaaaiinnss!” catchphrase supposedly muttered by the dead could seriously mislead survivors. Firstly, zombies will happily eat any part of a living or very recently deceased human. Secondly, zombies cannot talk. Recognise the creature, shout a warning if you can, then get prepared for action! Remember, the zombie in front of you is no longer human so act with purpose. Do not endanger yourself with any warning; there may be occasions when you need to move quickly through Step 1. If you have a weapon, go for a solid club to the head. Aim for the top of the skull and use force but be accurate – a glancing blow may not do the trick. If you are unarmed, you will need to sweep the creature’s legs or kick it down. Remember, only a solid blow to the head will knock the creature down for good. Zombies are extremely robust creatures, so always be sure by delivering a second blow. Never assume that your one hit has done the job. Many an experienced zombie fighter has been bitten on the lower leg by a ghoul they thought they’d dealt with. For once, the movies got it right – always use the double-tap rule. If they are friends or family, surely they’ll know who I am? Simple answer, no! Once a human has transformed into a zombie, they have virtually no recollection of their former life. They are no longer the person they once were. So if zombie grandma staggers into view, it won’t be to drop off any last-minute birthday or Christmas presents. Do not be deceived by the physical resemblance to your loved one. It’s time to get busy with the axe. The zombic condition completely transforms any human into a ravenous and cannibalistic creature, and scientific experiments have shown that zombies will attack and feast upon the living, no matter who they are. It may not be easy driving a weapon into your neighbour’s face or bashing a friend in with a baseball bat, so if necessary get someone else to do it. But, be assured, if you don’t deal with zombie grandma, she will come drooling at the window. Finally, never attempt to bring a relative with the zombic condition into your fortified home. Where a member of your party has become infected, you should isolate them and then deal with them when they turn if you can’t do it beforehand.